STATE COLLEGE, Pa. -- A Penn State fraternity where a pledge was fatally injured in a fall down the stairs earlier this month was shut down Friday, and the school said it was working to tighten anti-hazing measures. The university said it will be at least five years before the Beta Theta Pi chapter might be allowed to regain status as a recognized fraternity. Police have said Timothy Piazza, 19, of Lebanon, New Jersey, was among about a dozen pledges present Feb. 2 for a pledge acceptance ceremony when the fall occurred. Help wasn’t summoned until the next day, and he died at a hospital Feb. 4. 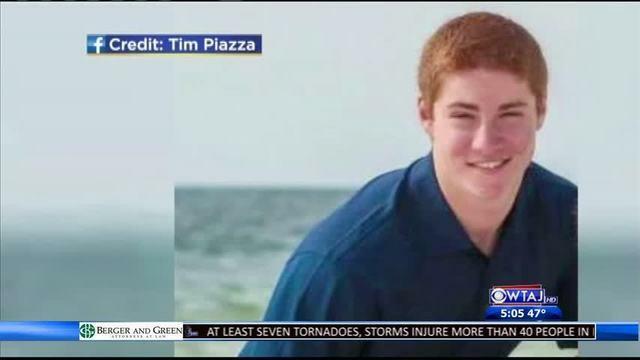 State College police are investigating and have said hazing and excessive drinking may have contributed to Piazza’s death. The fraternity’s national office announced it was closing the chapter based on what it had already learned. “These findings are not in keeping with Beta Theta Pi’s longstanding values of responsible conduct, mutual assistance and integrity,” the national fraternity said in a statement. The State College Police Department continues to investigate what role hazing and extensive drinking may have played in the sophomore’s death. The University says it continues to cooperate with that investigation. Earlier this week, members of the Interfraternity Council (IFC) executive board stepped down, that included the resignation of council president Alex Frederick. Penn State said it was working with the fraternity’s alumni board “to sort through questions” about housing for the students who have been living in the chapter house. At Penn State, the fraternities are private organizations and the chapter houses are private property. Penn State also said it will maintain an alcohol ban at fraternity-related social events at the main campus in State College for the rest of the spring semester, and it has halted fraternity recruiting until it can ensure effective anti-hazing efforts are in place. It said other changes to recognized fraternities will include no hard liquor at social events. State-certified bartenders must be serving when beer and wine are allowed, it said. In an unrelated development, a member of Beta Theta Pi at Penn State was arrested Friday and charged with several offenses related to dealing marijuana. Police said that investigation began in November.